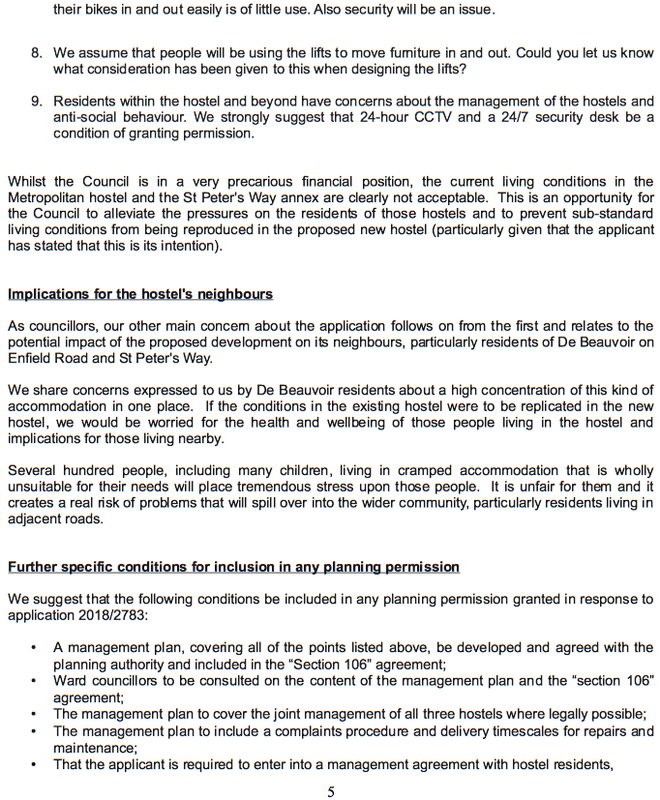 We took part in a recent discussion of the application convened by the De Beauvoir Association, and we listened to residents. 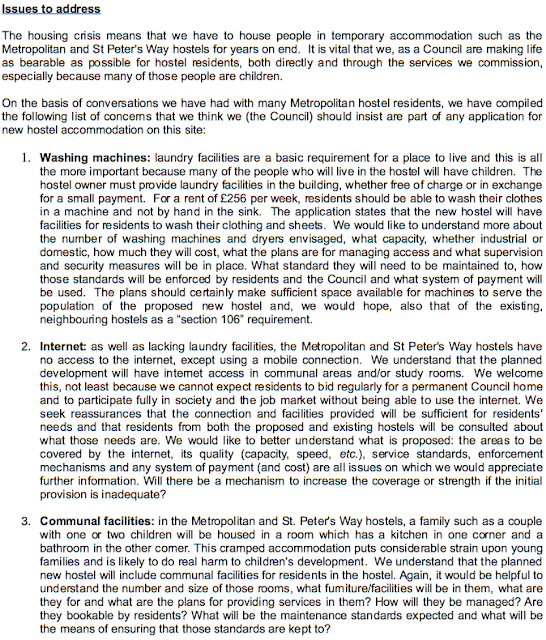 Below is a copy of a letter we have sent to the Council’s Planning Department, explaining a number worries we have about such a big hostel being built in De Beauvoir. In the rest of this blog post, we have tried to address some of the points made to us by De Beauvoir residents in person and by e-mail, and to place our thinking in the broader context of the dreadful housing crisis that we're facing in Hackney and, more broadly, across London. What we want to avoid is a private party making very considerable profits from the misfortune of our fellow citizens who can no longer afford the rocketing rents in Hackney. We certainly want to avoid that private party profiting but not ensuring decent living conditions for the people who will live in the hostel. That cannot be an outcome that the Council will allow. It should be clear to all of us that the housing market in Hackney is failing very many people who have grown up and live in Hackney. 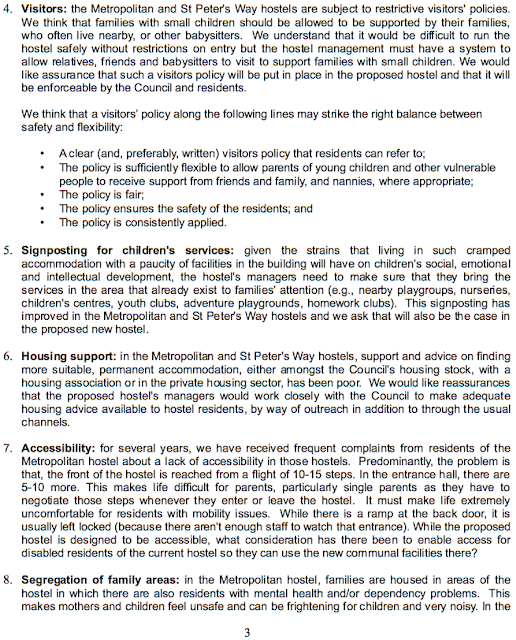 Every week, as councillors, we see the impact on people – including very many young children and teenagers – of long stays in, frankly, unsuitable conditions in homeless hostels around De Beauvoir. The people we deal with are ordinary people. Most are small and growing families. Most adults living in our hostels are in work, in the same way that most people who go to food banks have a job and most people who claim benefits are employed. It's just that being employed and being from Hackney no longer means that you can necessarily afford to rent a home in Hackney (let alone buy one!). The reality is that many people find themselves homeless while employed, with children and through no fault of their own, often evicted by landlords seeking higher rents, exploiting the law that means that people have short-term, insecure tenancies. Short of a deposit, facing insecurity in work and with responsibilities to their families, people don’t choose to be in this situation. It is in these circumstances that the Council has an obligation to house them and that is a duty that we should be proud to deliver. These circumstances don’t appear by accident. They are the obvious consequences of this Conservative government's policy and inaction. No one, least of all us, would choose hotel accommodation as a solution to the shortage of affordable housing in our borough. The length of time Hackney residents end up in “temporary accommodation” means that it's very far from being "temporary". In the absence of any meaningful Government support, Hackney Council continues to build as many social homes as it can - including in De Beauvoir. Unless and until there is a change of government and consequent radical change in housing policy, we will continue to live through a crisis of unaffordable housing. Hackney Council can’t solve this crisis alone but the Conservative government could fix it. It’s just that it won’t; they clearly don’t care. Why not build permanent social housing on this site? 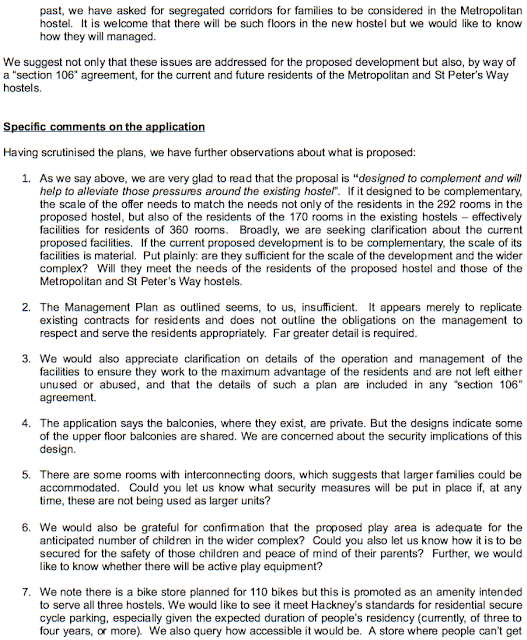 Some residents have asked why this site cannot simply be used to build permanent social housing, in which local families could settle, rather than those families being housed in cramped, individual rooms (as, we understand, will be the case in the proposed development). The first reason is that the applicant hasn't asked for planning permission to build flats. 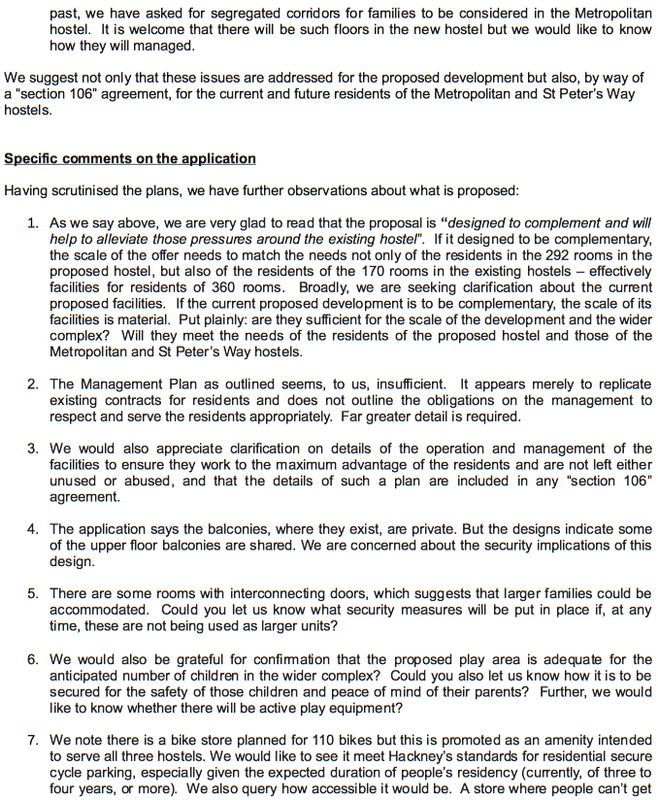 The applicant has asked to build a hostel and this is privately-owned land. 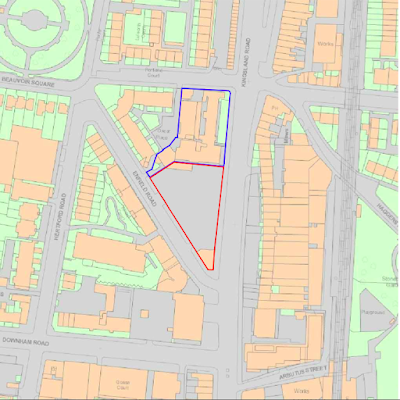 If the application complies with the relevant planning law and guidance, the Council's planning department will have to recommend granting the permission. We very much sympathise with neighbouring residents' views but we also recognise that it is unlikely to be within the planning authority's powers to reject the application out of hand. 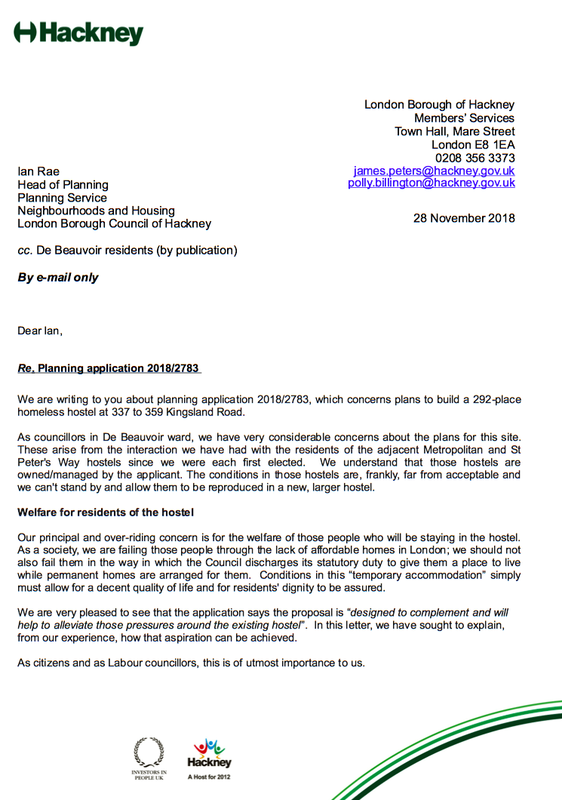 The second reason is that the Council desperately needs “temporary accommodation” to discharge its legal duty to provide housing for people who genuinely have nowhere to live. The Council's preference is always to keep people in Hackney, close to jobs, friends and family. Local housing authorities, such as Hackney Council, have a legal duty to ensure that suitable accommodation is available to those homeless households accepted as in priority need (such as families with children and households that include someone who is vulnerable, for example because of pregnancy, old age, or physical or mental disability) provided they are eligible for assistance and unintentionally homeless. Over the past few years, Hackney Council, along with all London boroughs, has faced a massive increase in the number of households approaching it as homeless and needing help. The situation in Hackney is probably worse than in most other boroughs because we've seen very sudden increases in housing prices here (both to buy a home, or to rent). For example, Foxtons estimates that the average weekly rental for a two bedroom flat in Hackney is £579, which is more than the estimated average weekly pay in the borough. But price isn't the only factor: insecurity of tenancies means that landlords can evict a family at the end of an annual tenancy if they think they can get a higher rent from someone else and the Conservative Government's welfare changes are pushing many in Hackney into precarity and deprivation. 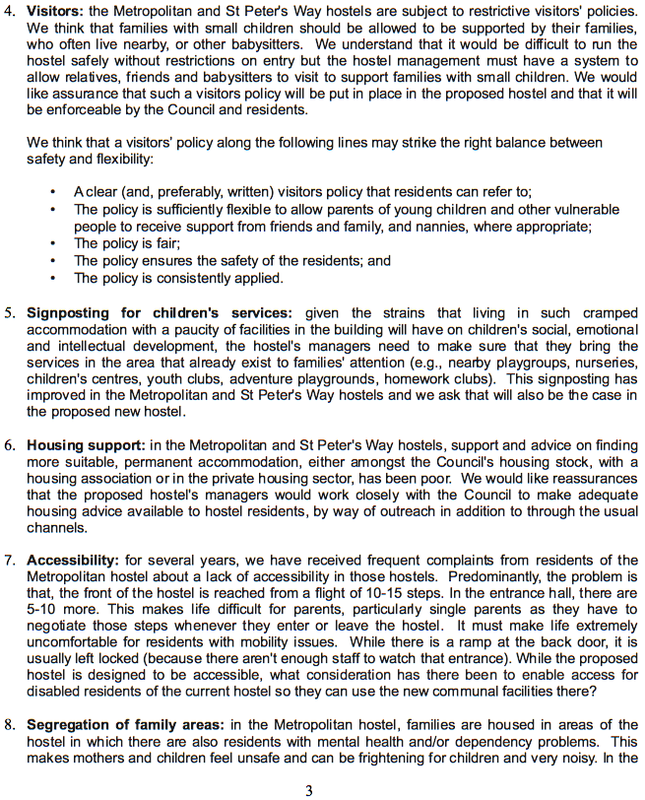 As we say above: many, if not most, people who are staying in Hackney's hostels are employed. 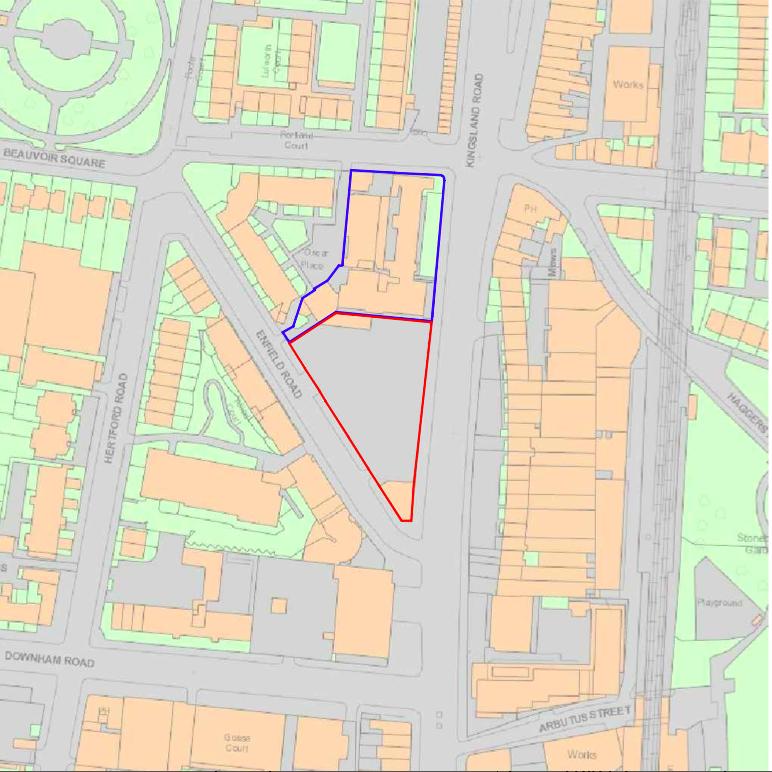 The flow of people approaching the Council as homeless, and to whom the Council owes a duty to house, is greater than the number of homes the Council has available and the number of new social homes it can build in the borough. 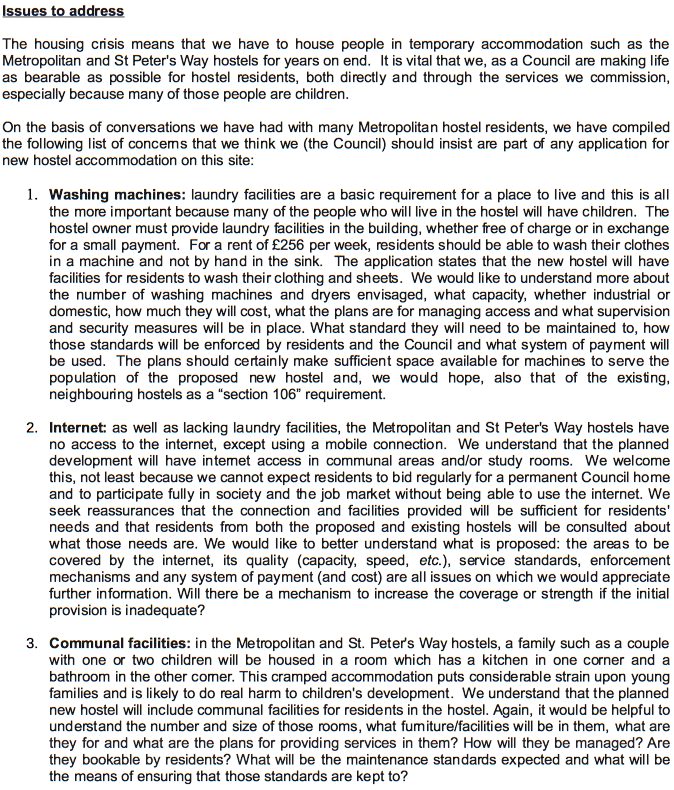 So, the Council needs more of this “temporary accommodation” (which, sadly, is not particularly “temporary” given the 3 to 4 year duration of stays at the moment). If the Council doesn't find temporary accommodation in Hackney, it will have to look outside of Hackney, probably far outside. This may move people a long way from their families, jobs, children's schools and support networks, which will be highly disruptive for them and, probably, increase the burden on public finances. Why isn't the Council building homes for everyone who needs them? Rather than using hostels, we would far rather be building long-term, quality homes for people from Hackney. We're delivering one of the biggest programmes of council house building in the country, and that’s with almost no help from the Conservative Government. Until 2010, councils were given grants from the (then) Labour Government to build social housing. Until the Labour Mayor of London started funding council housing again this year, the Conservatives had stopped all funding for affordable homes to rent. But it's even worse than that, with restrictions placed upon councils' use of “right to buy” receipts and artificial restrictions on borrowing (only just abolished), this Conservative Government actively stands in the way of council home-building (at a time when the private sector isn't delivering the homes we need). 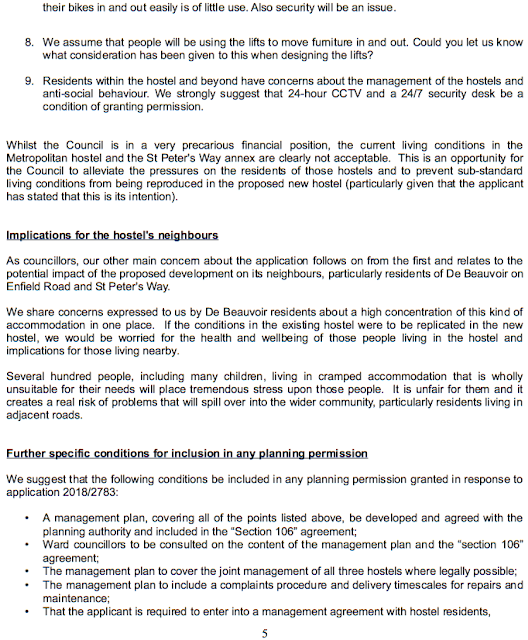 Social housing is part of the solution and will reduce some of the pressure, which is why the council is proposing to use its land to build 150 new homes on the De Beauvoir estate as part of the Council's "Housing Supply Programme" - two thirds of which will be affordable (either social rents or shared ownership), with the rest for private sale to pay for them in the absence of Government funding. The Council will also offer the properties first to those in housing need in the local area, or living in overcrowded conditions on the estate. This is part of our plans over the next five years to build, directly or with our partners, over 3,000 new homes across the borough including 800 new council and social rented homes and 700 council shared ownership homes. The Grenfell Tower fire was a tragedy. We still don't know how many people died in it but we know that it was a lot. The response to the Grenfell Tower fire continues to add to the tragedy. Hundreds of families in Kensington are homeless because of it. Their lives are in turmoil and most are living in hotels with little support and little idea of what their future holds, if news reports are correct. Like 2009's Lakanal House disaster, the Grenfell Tower fire clearly has implications for every other council in the country, including Hackney Council. There are fire safety lessons to be learnt and immediate action to be taken to reassure residents that they are safe in their homes. 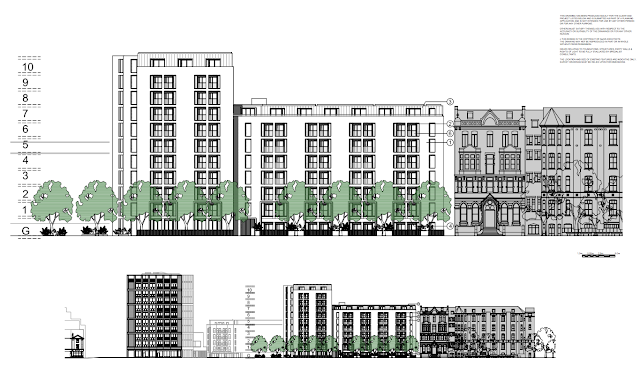 In De Beauvoir, we have 6 Council-owned tower blocks and some other tall, residential buildings in private ownership. The 6th tower block is on the Kingsgate Estate, in the northern part of De Beauvoir, near Dalston. The cladding installed on the outside of Grenfell Tower appears to have contributed to the fire spreading. None of the Council's tower blocks in De Beauvoir has any sort of cladding. Nor have any of the private tower blocks (from looking at them). 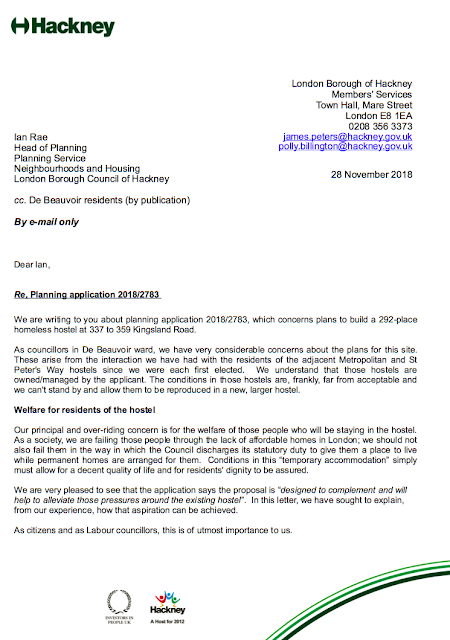 Since the fire, the Council's Director of Housing Services has written a series of letters to everyone living in a Council property to let them know what the Council is doing in reaction to the Grenfell Tower fire. Much of the rest of this blog post reflects what was said in the most recent letter. 1. The Council has an up-to-date fire risk assessment for every single one of its housing blocks. 2. The Council does not use the type of cladding, or the contractor, used at Grenfell Tower. Initial inspection: Council officers completed an initial inspection of all cladding on Hackney Council buildings within 48 hours of the Grenfell Tower fire. 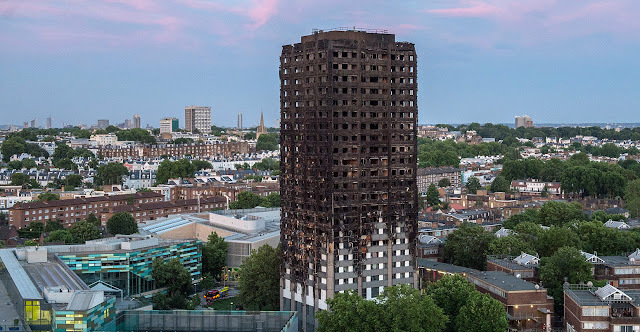 No Council-managed estate blocks have the same cladding that was used on the Grenfell Tower. Specialists from a company called Cladtech Associates are visiting blocks to test any cladding. The idea is to provide more reassurance that people are safe in their homes. Cladtech Associates may remove sections of cladding from some blocks for testing – this is nothing to be concerned about, and is part of the comprehensive fire safety review. Also, Council staff are checking the fire safety of things like fire doors and dry risers. They will be easily identifiable and will carry official ID. Residents will not need to take any action while this work is being done. It will not affect the buildings in any way. Independent fire adviser: in order to have an expert view on what the Council needs to do to be even more sure about fire safety in its buildings, we have appointed an independent fire adviser, someone who had been the London Fire Brigade's borough commander for Hackney. His name is Graham Howgate. Graham provides advice on fire safety matters and is very familiar with the borough and our estates. Hackney Fire Safety Response Group: the Council has set up a group which includes Hackney’s current London Fire Brigade Borough Commander and senior members of staff from across the Council. This group meets weekly to ensure the aims of our fire safety action plan are met and to keep the Mayor of Hackney and the Cabinet Member for Housing regularly updated. A fire safety review: this will happen across the borough. The Council will look into a range of fire safety measures, such as fire safety signs, the information given to residents and the use of sprinklers. 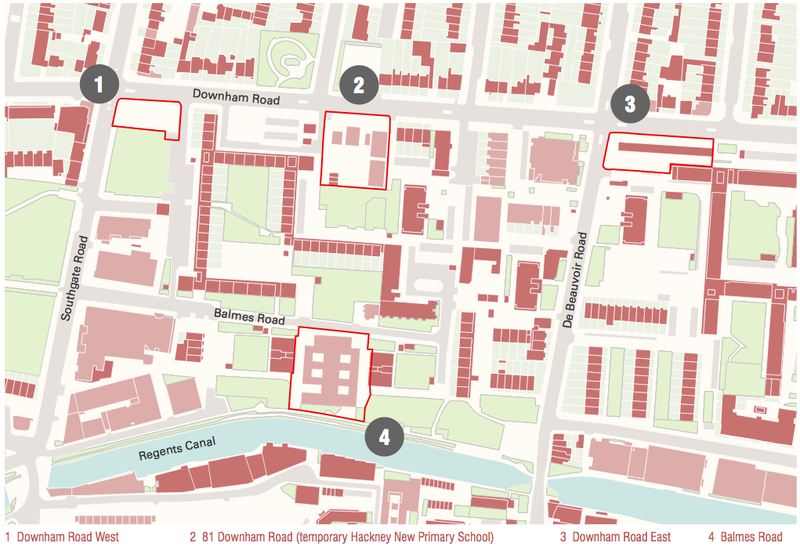 Looking at fire engine access: we've asked the London Fire Brigade to visit estates over the coming weeks to look at fire engine access into estate car parks. It is important that vehicles are not parked in areas that could hamper the fire services access – please report any cars parked dangerously. Putting all fire risk assessments online: we will put all of the Council's fire risk assessments online. Due to the number of assessments and the need to present the raw data so that it is easy to understand, this may take a number of weeks. When the Council's fire safety review is complete, Council officers will consider the findings with the independent fire adviser and the Council will write again to everyone living in its properties to tell them what it plans to do in each block. The recommendations will be agreed once the Council knows that all the fire safety measures have been addressed. It is important we all do everything we can to keep our estates safe. You can report any faulty fire doors or fire safety equipment immediately to Housing Services on: 020 8356 3691. If you have any questions or concerns about fire safety on your block or estate, please contact the Neighbourhood Contact Centre on: 020 8356 3330. Q: I have cladding on my block, is it the same as that used on the Grenfell Tower? A: No. The Council does not use this type of cladding and it is not on any Council-managed estate. Q: Will the Council's fire safety review look at cladding? A: Yes. The Council is reviewing cladding used on Council estates using an independent specialist called Cladtech Associates. The cladding will be visually inspected and will then be tested and fire safety-rated on some estates. 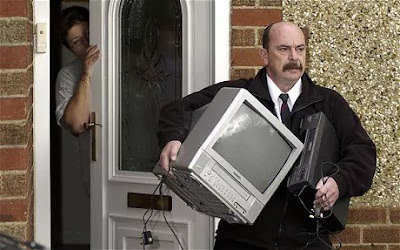 Work started this week and you may see inspectors on estates in the next few days. They will be easily identifiable and will be carrying official ID. Again, there is no reason for concern as this forms a part of our wider fire safety check. 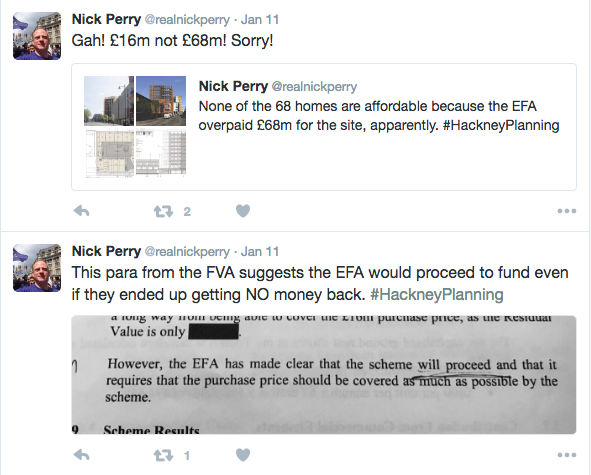 Q: Other local authorities have already removed cladding, why hasn’t Hackney? A: The Council completed an initial inspection of all cladding within 48 hours of the Grenfell Tower fire and found no fire safety concerns. The Government requested samples of specific cladding. The Council does not use any of this cladding and therefore is not required to send any for testing. However, for added reassurance the Council will be reviewing fire safety across all estate blocks. The Council has also commissioned an independent cladding specialist to visual inspect, test and fire rate the cladding on some estate blocks. Q: Will you be installing sprinklers in council blocks? A: Once we have the results of our fire safety review, and on the advice of the independent fire advisory service, we will be looking at the option to install sprinklers in our estate blocks. Q: The Metropolitan Police have said that a Hotpoint FF175BP fridge freezer was the initial source of the Grenfell Tower, what do I do if I have one of these fridge freezers? A: Owners should register their appliance with the manufacturer to receive any future updates and recall notices. Check you model number which is usually found on a barcode sticker behind the salad container in the fridge. Owners of a Hotpoint fridge freezer model FF175BP (White) or FF175BG (Graphite) should call the manufacturer's freephone hotline on 0800 316 3826. Q: Will I have to evacuate my block because of the cladding like residents have in Camden? A: No. All of our buildings have an up to date fire risk assessment and no Council-managed estate blocks have the same type of cladding that was used on the Grenfell Tower. Any priority work needed following these assessments has been done and we continue to monitor fire safety, using estate inspections and our estates officers. In addition, all buildings have up-to-date certification for dry riser testing and electronic certificates - these are assessed twice yearly with one test and one visual inspection. The Council undertook its own inspection of cladding within 48 hours of the Grenfell Tower fire and found that no Council-managed estate blocks use the same cladding that was used on the Grenfell Tower. Residents of Camden Council estate blocks have been asked to leave their properties temporarily for their own safety after cladding of a similar type that was used on Grenfell Tower was found. There were also other fire safety concerns inside of the estate blocks. Q: Should residents stay put, or evacuate in the case of a fire in a block of flats? A: The London Fire Brigade has advice about what to do in the case of a fire in a block of flats, you can see this advice below or for more information, visit: www.london-fire.gov.uk/know-the-plan-campaign.asp. Q: What if I live in one of the Council blocks that’s been told to evacuate? 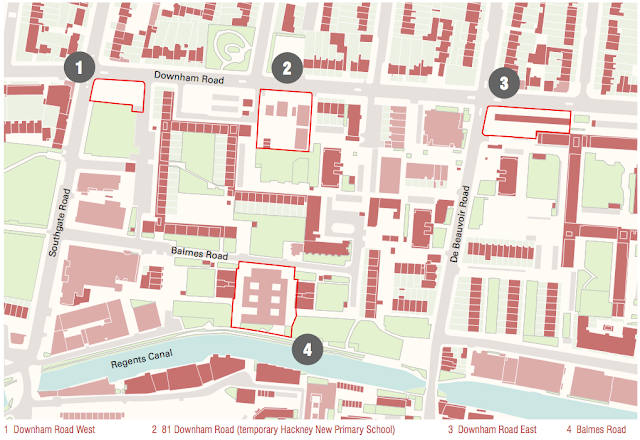 A: There are some purpose-built blocks in Hackney that have an evacuation policy where the London Fire Brigade advice is to leave because of the design and layout. You must follow this advice if you have been told specifically by the London Fire Brigade, the Council or if there are evacuation signs in your block. 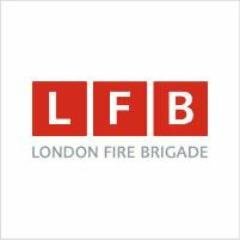 Q: What is the London Fire Brigade advice? A: The London Fire Brigade advice can be seen below. The exception to this is if you live in a scissor block or have been told specifically by the London Fire Brigade, the Council or if there are signs in your block telling you to evacuate if there's a fire. Follow your escape plan (ie plan your escape and know how to exit the building if you need to). Most fires in the home start accidentally and ensuring you have working smoke alarms in your home will provide a vital early warning for danger. That is why it is important and essential to test them every month to make sure they are all in good working order. If you're having trouble paying your energy bills don't use candles or naked flames as a substitute for heating and lighting. Your electric and gas supplier may be able to provide you with free or subsidised energy efficiency measures, such as insulation, or a discount on your bill. Contact them to find out if you qualify. Working smoke alarms should wake you if a fire does break out but you can further reduce your risk by carrying out some simple checks before you go to bed. ...there have been reports about a building in Woodberry Down, in the north of Hackney, having cladding similar to the Grenfell Tower cladding. 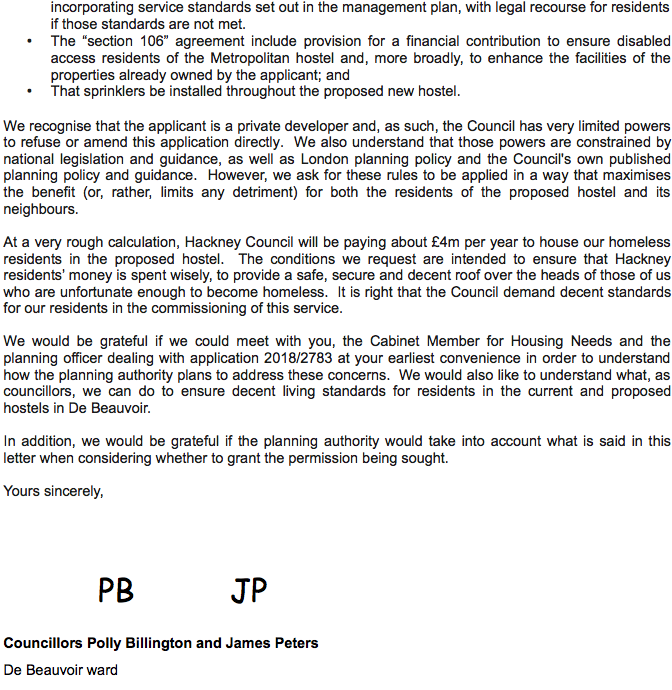 Labels: "De Beauvoir Estate", "de beauvoir", "Fire Safety", "Grenfell Tower", "Grenfell", "hackney", "james peters", Grenfell Fire"
Next week, I'll be asking Council finance officers about how we make sure that we, as a Council, aren't adding to Hackney residents' financial hardship during these tough economic times. 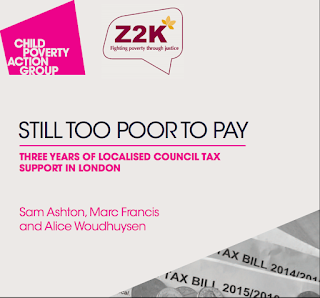 If residents are genuinely too poor to pay Council Tax, there is a scheme to help them. That scheme is called the Council Tax Reduction Scheme (or "CTRS"). This a matter that Hackney councillors have discussed on a number of occasions recently, particularly when deciding to increase rates of Council Tax in Hackney. These are also matters that seem all the more pressing given that Council Tax is a regressive tax, hitting the poorest hardest, and the increase that we decided comes during a time when vulnerable residents face a significant reduction in other benefits (and ever-growing living costs - which seem likely to be about to accelerate as a result of the pound dropping in value because of the referendum result). It is also over 2 years since administration of the CTRS was devolved to Councils by central Government (along with a not-so-sneaky cut). 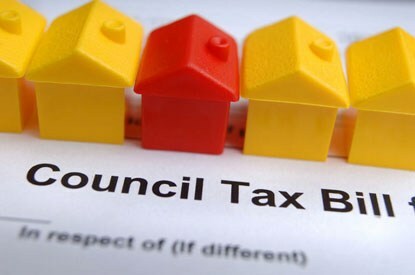 For all these reasons, it seems to me that this is an important time to take a closer look at how we collect Council Tax, to make sure that we're not aggravating financial hardship. Other London Councils have reacted to growing financial pressures on households by recognising that they (the Councils) may be major creditors of those households, so should do more to support vulnerable debtors. 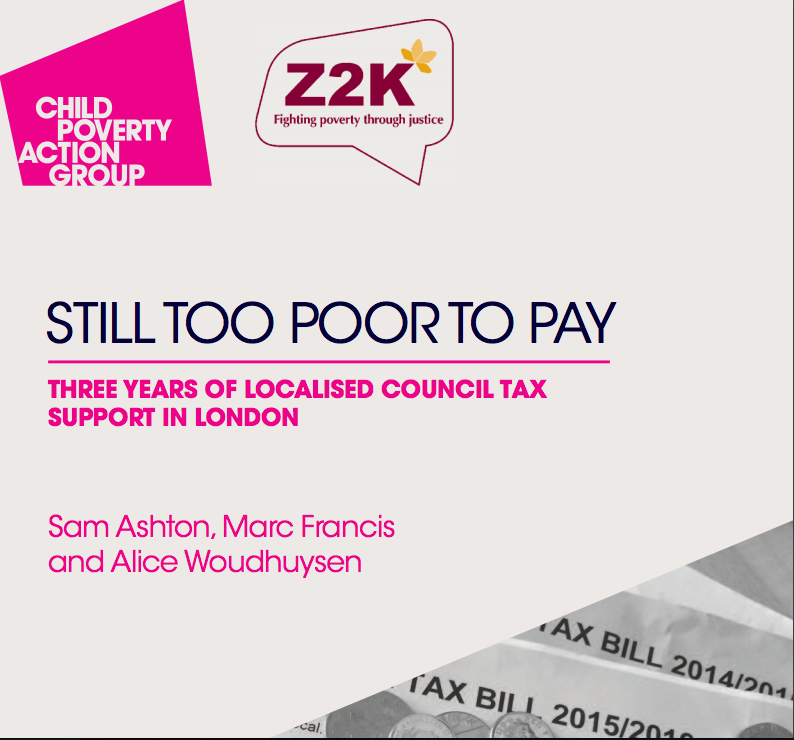 Put another way, we shouldn't be contributing to poverty in Hackney through our CTRS and Council Tax collection policies. 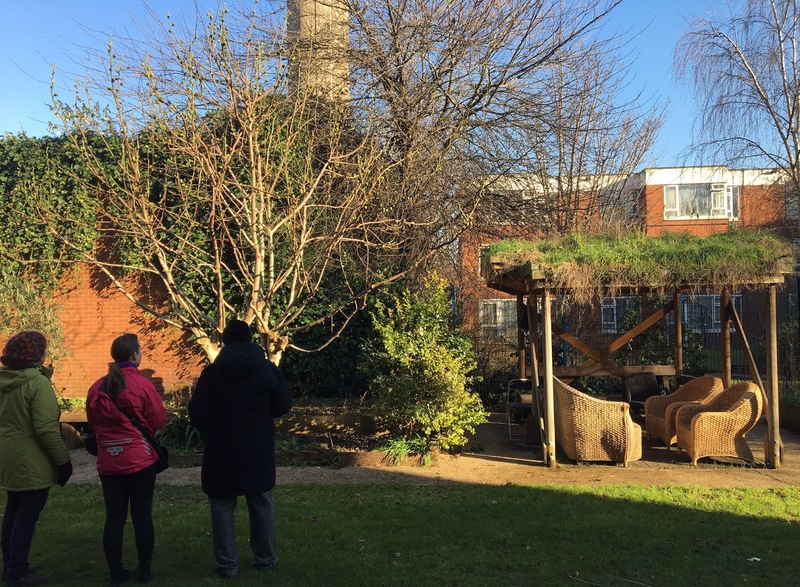 Lambeth Council: development of an "Income and Debt Strategy" that saw Council services working together to identify and support vulnerable residents who are slipping into debt. This strategy has led to a 75% reduction in summonses obtained by the Council (8933 to 2176) after one year and ZERO use of bailiffs to collect Council Tax from residents on CTRS. Lambeth appears to have increased their Council Tax collection rates as a result of the strategy. And it seems to have worked, as this paper shows. Successes in the paper show better identification and support for vulnerable residents AND £200,000 more Council Tax than the cost of bringing the bailiffs back in-house. That's £200,000 that Lewisham Council would not otherwise have collected and the Council predicts that that figure will increase by £600,000 by the end of this financial year. On the basis of the above, I think we, in Hackney, should look into at CTRS and collection policies to check that they reflect our values. 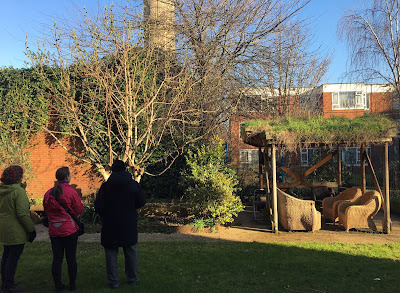 Yesterday, I invited members of the De Beauvoir Estate tenants and residents' association (or the "TRA") and members of the De Beauvoir Gardeners to visit estate gardening projects in the east of Hackney. The projects in question are in Clapton Park, in King's Park ward. 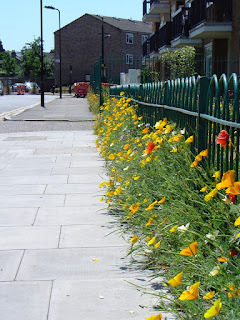 The Clapton Park estate is well know for its allotments, vegetable patches, fruit trees and, above all, the poppies that abound in even the smallest spaces across the three estates managed by the local tenants' management organisation. The De Beauvoir Gardeners have been gardening in De Beauvoir for the last 40 years, although not necessarily on the estate. With that wealth of knowledge and experience, I saw an opportunity for them to lend a hand to the TRA in getting the estate gardening projects up and running. You can find more about the De Beauvoir Gardeners here. 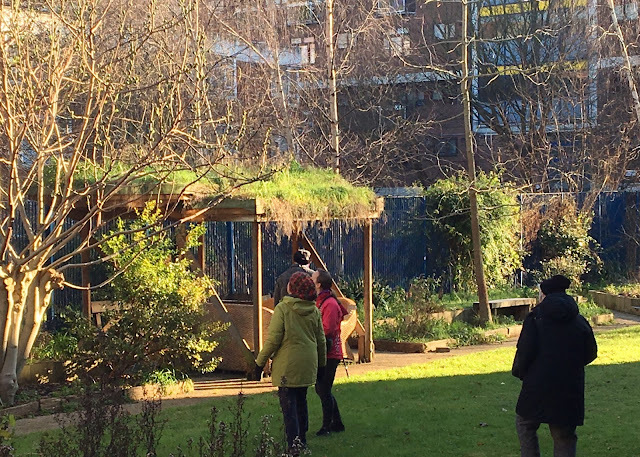 So, I thought it would be a good idea to get the TRA and the De Beauvoir gardeners together in Clapton Park to see things we can do in De Beauvoir. Chairs and a green canopy to enjoy the fruits of the gardeners' labour. A good example of a green roof, a fruit tree on the right and homes for bees on the side of the shed. Brackets for hanging baskets, ready for when the weather's better. Planters looking wintry but ready for new growth come the spring. More planters, also awaiting warmer weather to spring into life. Trees can also spruce the place up. I hope that we all came away with ideas that can be transplanted to the De Beauvoir estate. I also like to think that we may have started to form useful relationships between the TRA and the De Beauvoir Gardeners to help a gardening project like those shown here to flourish in De Beauvoir. 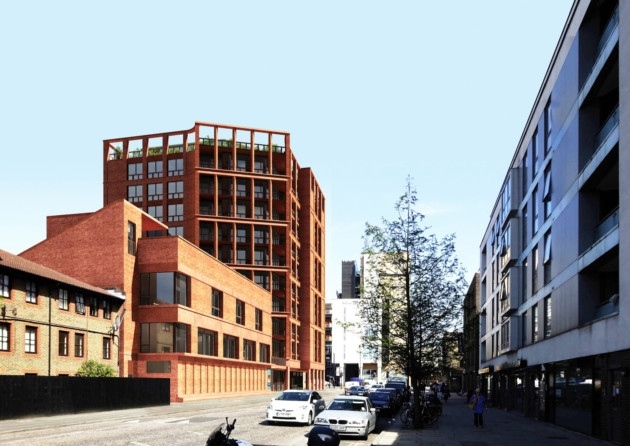 Last Wednesday, I went to the planning meeting at the Town Hall about the building planned for the site of the old fire station on Kingsland Road. I went to explain why the Council must make sure that those applying for planning permission include affordable housing in their buildings - that's to say, homes that people in Hackney can actually afford to live in. If you're interested, you can read my objection to the original application here. You may have seen the coverage in the local press. To put the discussion in context, I spoke about the housing crisis that we're facing in Hackney (here's a good piece about the dire local situation and some more facts and figures). We literally have thousands of Hackney families in emergency housing because housing is too expensive in Hackney. And I'm using the word "literally" literally in that sentence. We desperately need more homes that aren't priced out of reach for ordinary people. So, if a new building is going to have more than 10 homes, 50% of them should be affordable (and, unless there are exceptional circumstances, the affordable homes must be in the building). Here, we had an original application for a block of 68 flats with zero affordable housing. None at all. 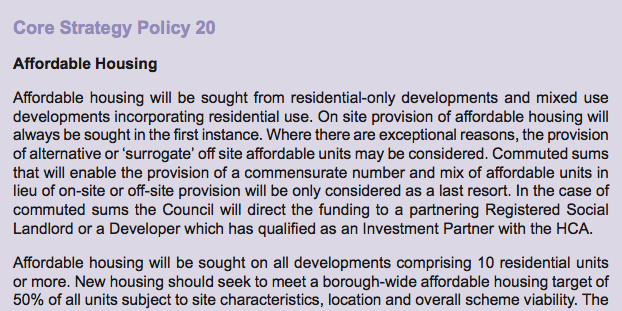 At the meeting, I asked how granting the planning permission could possibly be compatible with our planning policy. ...and we need developers to do so too. The developers should put all their cards on the table and planning committees should examine very closely any claims that their schemes' finances don't allow them to build any affordable housing. I asked the planning committee to postpone its decision and to really take a look at whether we could ask the developer to build affordable housing in the development for which they were asking for planning permission, or whether it would make the whole scheme unviable. After all, our "core" planning policy says that we will do this (see above) and during this housing crisis, we need all the affordable housing we can get. 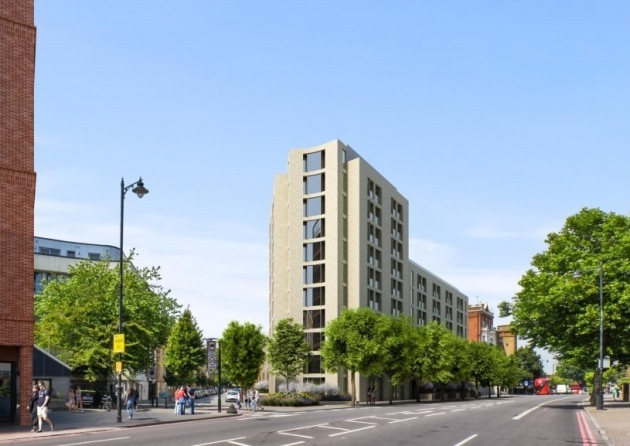 In the end, the applicant said that they would give the Council £1.5 million to build homes somewhere else in Hackney and the Council's planning committee granted the application. You'll find news reports here and here. And if you're wondering about what has happened to fire engine response times in De Beauvoir since Boris closed our local fire station, there are a few figures in this report. 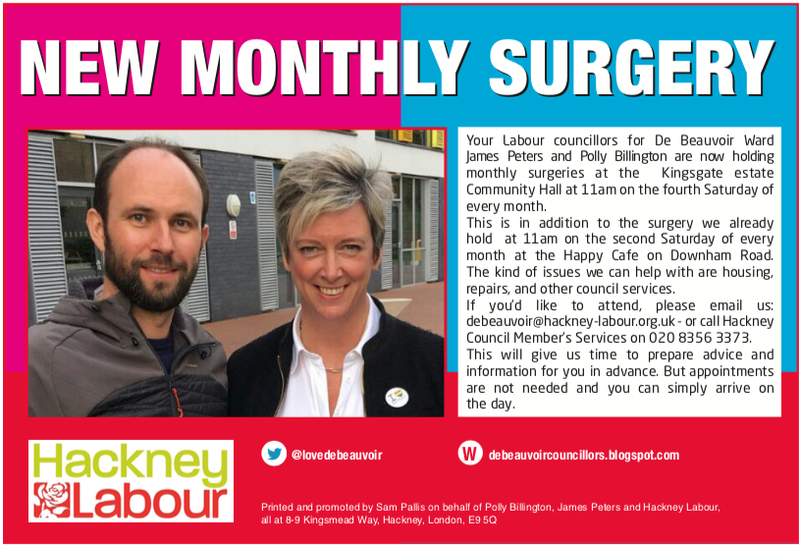 Promoted by Sam Pallis, on behalf of De Beauvoir Branch Labour Party, 8-9 Kingsmead Way, Hackney, London, E9 5QG.